As Socks that rock yarn is becoming easy to get through their website, I will probably not renew my membership for 2007. I like their lightweight the most (whereas the club alternates light and medium) and can specifically pick the colors that I like. - socks for my mom: one down, one to go! 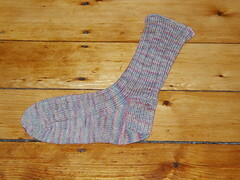 I bought the yarn while in Nova Scotia, it's Fleece Artist in "Baadeck summer", the pattern is "Pair of socks" by Ann Budd on the Interweave website. 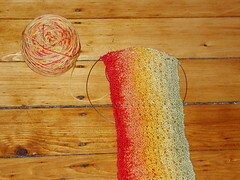 - Pooling colors scarf from Interweave Fall 2004. The yarn is Schaefer Anne bought from the lovely Sheri at The Loopy Ewe. - a simple K2P2 rib cowl made out of Handmaiden 2-ply cashmere. 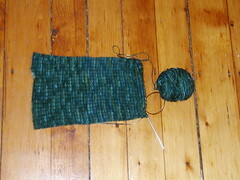 I'm making this long enough to either fold it in two (like a turtleneck) or to put it over my head and cover my ears. This yarn is just wonderful to work with -- if I had enough money, I would make a sweater out of it! yay, minky updated her blog :) the pictures are nice! your mom's sock looks shiny in the picture. hope the studying is going well. I'm in Sundra and Socks that Rock club. Great pictures and great blog. Your blog is off to a great start. Love the pictures! minky, you need to update your blog so i can see what pretty things you are doing these days!